Caldwell’s state-of-the-art Sinidex lock is now available with PAS24-accreditation on Liniar profiles, Eurocell’s Logic, Modus and Modus Flush systems, Deceuninck’s 2500 and 2800 systems and Kommerling Gold. Exclusively available in England through respected hardware distributor Window Ware, the cutting-edge Sinidex system can now add industry-leading security credentials to its long list of features and benefits. The product boasts a whole host of fabricator-friendly features, including intelligent floating mushroom technology that offers robust performance and excellent tolerance, even with sash drops of up to 6.5mm, while ensuring the window always locates. It also provides time-saving routing prep, the same as is found on a standard espagnolette, and handy lines on the rod to aid keep alignment. It’s eventually set to form part of a full casement window guarantee package, including stayguards and hinges, allowing customers to quickly and easily manufacture high-performance products. “A best-in-class lock system just got even better,” comments Caldwell Sales Director Tim Ferkin. “We always knew that the Sinidex lock was outstanding across the board – but now, with PAS24 accreditation, the industry can have confidence that it offers world-class security performance. “We want to offer fabricators a comprehensive, all-in-one window hardware package that meets the demanding standards of an ever-more competitive market place. “At Window Ware, we’re passionate about providing our customers with great products, and the fabricator-friendly Sinidex is exactly that! 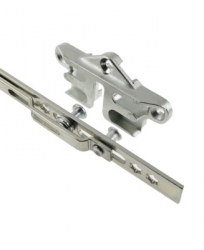 Switching or incorporating the Sinidex security window lock is pretty straightforward too because the lock conveniently fits a standard espag rout. “What’s more, rods are ready marked to aid keep alignment during assembly and streamline production. Available with 20 or 22mm backsets and 7.5 or 9mm mushroom cams, plus an expanding range of profile-related security keeps, the Sinidex lock comes in a wide range of sizes to fit most PVCu windows.